A common day to day task in Drupal is managing files that are used within the pages you have created. Using the Media and LinkIt modules this task becomes straightforward. The two tasks below are uploading a file, which will automatically create a link to itself and using LinkIt to link to an existing file. Within the page you would like to modify click the Edit tab to go to the editing interface. In the main WYSIWYG area, click the media icon. It is a square with a mountain inside of it. Usually it is the last icon on the right, or if your button dock wraps it is the last icon on the second line. Click the Browse button and find the file you wish to upload. It can be an image, a PDF, etc…There is a listing of allowed file types in bold below the Browse button. Click the Upload button once you have selected the file you wish to upload. Next click the Submit button, if the file is an image fill in the Alt field by describing the image, and then click the Save Button. Click the word cancel if you do not want to automaticlly embed the file to the post or submit if you wish to include it on the page. In the main WYSIWYG area select the text that needs to become a link and then click the LinkIt icon. It is a chain link with a green plus next to it. It is always found next to the media icon. Search for your file by the file name you used and select the appropriate result by clicking on it. Once selected a URL will appear in the target path field below. Hover over My Workbench -> Create Content -> Slideshow and click. Fill out a tile for your slideshow. Ciick the browse button to upload a photo. You can upload as many as you wish. Provide a verbose description of the image in the alt field. Fill out the title field if you would like a caption below the image. Links in the caption or image. If you want a link in your caption you must put in the HTML manually. For example, to link to Western’s homepage, you would type the following. <a href="http://wwu.edu">Caption Text</a>. Slideshow examples can be seen on our demo slideshow page. Select the appropriate group for the slideshow. If you wish to place the slideshow within a specific page you will need to leverage panels to do so and insert the slideshow into a panel pane. 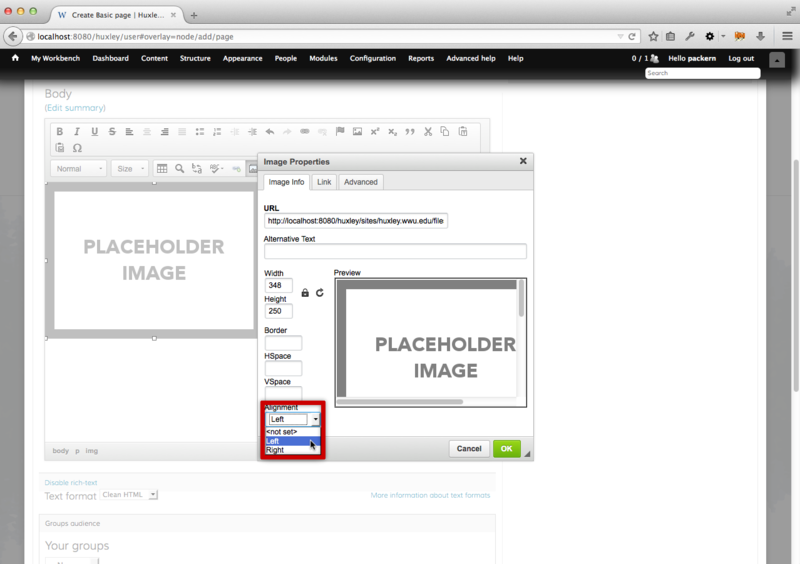 Add the title attribute of an image when inserting the image via the Media Browser. Edit the title attribute of an existing image (i.e. an image already inserted) by selecting the image and clicking the Media Browser button in the WYSIWYG toolbar. 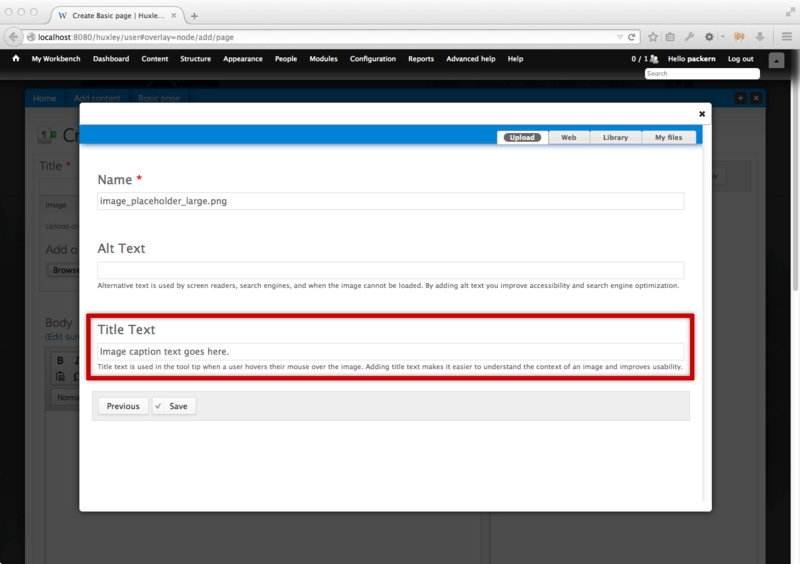 This will let Drupal know that it should convert the title attribute of an image into a visible caption. If this class is not set, no caption will appear. Select “Image Properties” from the contextual menu. Locate the field “Stylesheet Classes”. 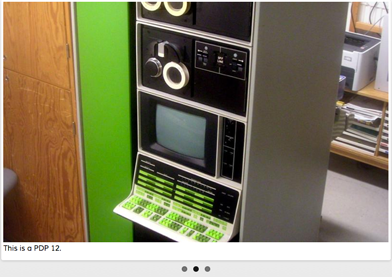 Append “wwu-caption” without quotes to the contents of the field. Click OK to close the Image Properties dialog. Image captions are processed for display after you save the node. 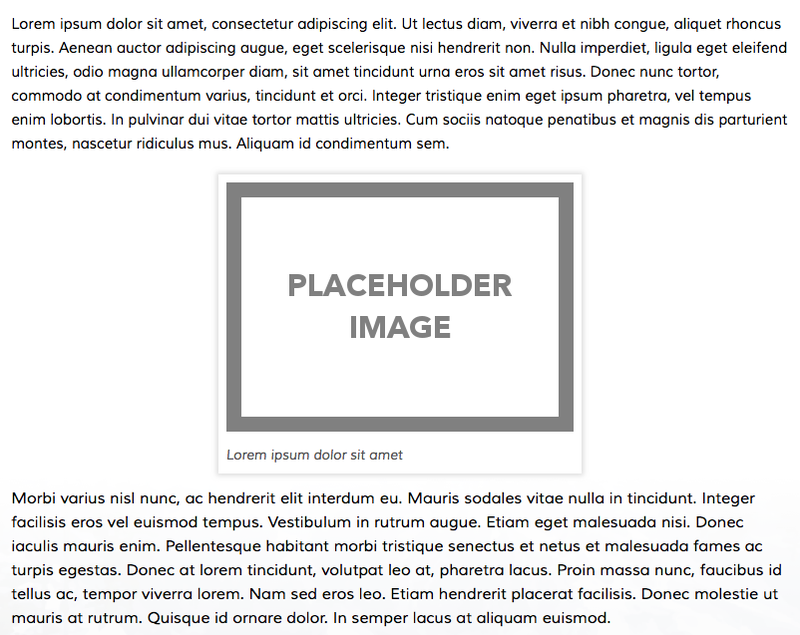 As such, you will not see image captions in the WYSIWYG editor. You may use the preview button, if available, or simply save and view the node in order to check the display of your captions. By default, a captioned image will appear horizontally centered in the content area of the node into which it is inserted. Text will break before the image and continue after it. To align an image to the left or right side of the page, use the “Alignment” drop-down found in the “Image Properties” dialog. This will force the image to the specified margin and text will flow around it. 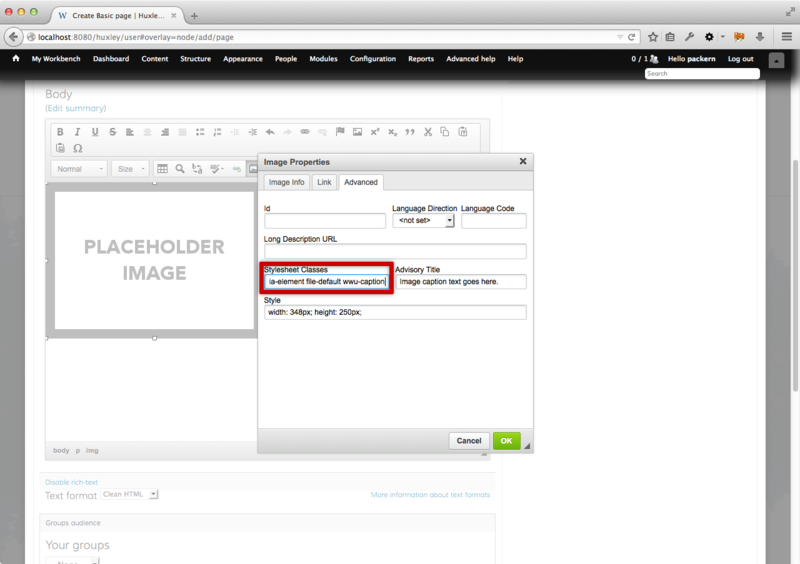 By default, image captions are enabled for any text input that uses the “Clean HTML” format. 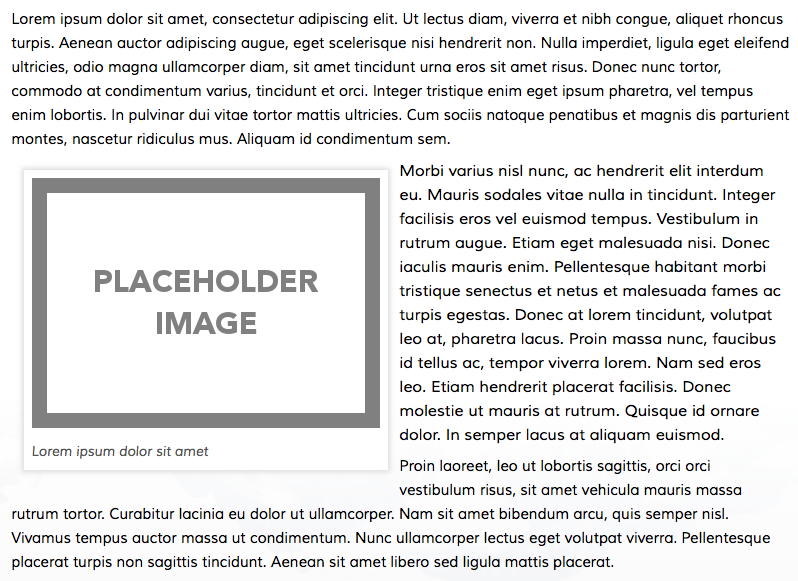 Image captions may not work if the text format is set to “Full HTML” or “Plain text”. If image captions are not appearing, and you believe that they should be, make sure that “Clean HTML” is selected in the “Text Format” drop-down below the text area.